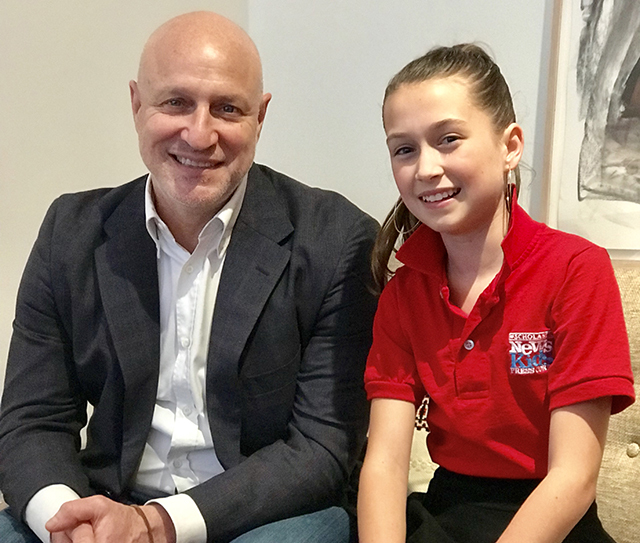 Healthy Plate, Healthy Planet | Kid Reporters' Notebook | Scholastic Inc.
Amelia with Tom Colicchio in his New York City office. The award-winning chef is featured on Bravo’s Top Chef. On April 22, events in honor of Earth Day called attention to climate change and the need to preserve and protect our natural resources. Several chefs and others in the food industry are doing their part every day. They are leading a “farm-to-table” movement, which has grown increasingly popular in recent years. The chefs say that meals taste better when they are made with fresh ingredients that are produced nearby and reflect local growing seasons. Proponents of the movement support local farms, fisheries, and other economically-sustainable businesses. Some chefs are even growing their own fruits and vegetables. • Tom Colicchio, who appears on Bravo's Top Chef, is the founder of New York City-based Crafted Hospitality, a group of restaurants around the country. • Dan Barber is the chef and co-owner of the restaurants Blue Hill in New York City and Blue Hill at Stone Barns in Pocantico Hills, New York. • Stephanie Diaz is a manager at Brooklyn Grange in New York City. The organization sponsors hands-on farming workshops at their rooftop farms in Long Island City and the Brooklyn Navy Yard. Why is it important for young people to care about food waste? Colicchio: As a country, we waste about 40 percent of what we produce. The average family throws out about $1,500-$1,800 worth of food a year. We’re not only wasting the food, we’re wasting the water. We’re wasting energy from farmers out there running their tractors. But even worse, we’re not valuing the work of that farmer, or that fisherman, or that baker, or all the effort that goes into making our food. I think about my grandparents, who lived through the Great Depression [in the 1930s]. They valued food more because they lived through times where it was hard to feed your family. Food was scarce, and people were out of work. I remember watching my grandfather cook bacon in the morning. He would take all the bacon fat and strain it out. That was the oil he would use to cook because he didn’t want to waste anything. Gradually, a big change occurred in the United States. We began to rely on convenience foods. In fact, everything became about convenience. When I was a kid, we would go to the bakery. If we wanted fish, we would go to the fish store. And if we wanted meat, we would go to the butcher. We didn’t go to the supermarket to buy everything. We started to build a relationship with that baker, or butcher, or person at the fish market. We knew them and valued their work more. These days, when we don’t know the people who are making our food, it’s easier to throw it out. Young people should care because the resources on this planet are not infinite. Brooklyn Grange’s rooftop farm at the Brooklyn Navy Yard. Proponents of the farm-to-table movement rely on produce that is grown locally, sometimes in urban settings. You could have chosen any place in the country to run an adjoining restaurant and farm. Why did you choose New York City? Colicchio: When I first came to New York City and started working, not only did I realize that I could work here, but I also realized that I could excel here. For me, this became a home. Years later, I had an opportunity to work on a project where there was a lot of extra space, believe it or not. Three towers were supposed to go up in a particular location. They built the first tower. A couple of years went by, and they started building the second tower. Then the recession hit, and they stopped building. That left a large space, which we repurposed as a farm. It’s more like a big garden. We farm in milk crates. We take burlap bags, fill them with soil, line the milk crates, and grow in the crates. The farm is actually mobile. What have you learned from running a farm in the city? Colicchio: Growing fruits and vegetables in the city is a little different. The soil tends to be a little more acidic, so we have to get alkaline in there. We actually found that if we add chocolate shavings to our soil, it lowers the acidity. So we work with a chocolate manufacturer in Brooklyn and buy their shavings and use them to fix the PH in the soil. The other thing is that because we grow in milk crates, we can’t use some of the tools that facilitate farming. It’s very labor intensive and has to be done manually. It’s neat for us to have it right next to the restaurant. It poses some challenges, but it’s fun and worthwhile. What we really get out of the farm is that it’s a way to create a sense of community. School groups come in, and kids come to the farm to understand how things are grown. Believe it or not, a lot of kids see a tomato, but they have no idea that it came off a plant that was grown in the earth. What advice you would give to parents and others who prepare meals for picky children? Get them involved in the cooking. Little by little, my son is starting to broaden his tastes. Expose a picky eater to as much as possible. Encourage them to keep an open mind, and eventually, they will come around. You’ve mentored several of the country’s most talented chefs on Top Chef. Have you seen an increased interest in the farm-to-table movement as a result? Colicchio: Yes, I have. It’s interesting that you’re linking Top Chef to that movement. Going back to when I started cooking, which was about 30 years ago, some of us were very interested in just buying food from local farmers. Number one, we thought the food was better. When I was in my mid-twenties and I was working in France, one restaurant that I was working in was buying directly from farmers. In fact, the farmers would come to the restaurant and bring stuff in. I noticed a huge difference in the quality of what we were getting there, versus what I was used to getting in the U.S. When I came back home and was running a kitchen, I went down to the Union Square Farmer’s Market right here in New York City. Everything was there. It was all really fresh. It was 24 hours out of the ground, and it just tasted better. But the movement has now taken on a bigger role. We believe that the way the farmers we buy from grow fruits and vegetables is better for the environment. What is the one thing you hope visitors to Blue Hill at Stone Barns will learn? Barber: That’s a great question. I think that with each meal we serve, we try to expand the diner’s picture of what goes into a plate of food, whether that’s the type of crop rotation it took to grow the ingredients or the importance of using strong seeds. Our goal is to get people more connected to the nuts and bolts of our food system. I think the best way to do that is through incredible flavor. What advice do you have for people who live in urban areas who want to eat locally-grown food? Barber: These days, there are farmers’ markets in nearly every pocket of the city. Try to shop at those as much as possible. Better yet, start a conversation, and get to know the people growing your food. Understanding their needs is the best way you can eat more responsibly. Barber: When we talk about “food waste,” what we’re really talking about is how to use ingredients more effectively. Take broccoli, for instance. The part that you see in the grocery store is just a fraction of the entire plant that’s grown in the field. It actually has these big, beautiful leaves that are incredibly delicious but usually become compost or animal feed because no one buys them. As young people, you have a chance to flip that around by cooking and eating with all parts of the plant and all parts of the farm. The implications are enormous. What can schools do better when it comes to providing healthy lunches for kids? Barber: I still make both of my daughters’ lunches at home, so I can’t really speak to what cafeterias are offering these days. But I think a good place to start would be what I was talking about before with broccoli. Often, the most nutritious and cost-effective (not to mention delicious) part of the plant is also the most underutilized. If schools started cooking with carrot tops and lettuce stumps, they’d be able to make much healthier meals for a lot less money. Do your children help out on the farm? If so, how is that shaping their eating habits? Barber: Yes. My daughter Edith always makes sure to wake me up in time for the morning milking. I recently heard her scorn someone for eating a strawberry in March because it was “out of season,” so I think the message is getting through loud and clear. Farmers cultivate crops on Brooklyn Grange’s rooftop farm. Why did you choose this line of work? Do you have a background in farming or agriculture? Diaz: I was born and raised in New York City, at a time when farming in cities wasn't really on anyone's mind. In 2011, I went to college in Connecticut and studied earth science. It was there that I got my first exposure to agriculture, farming alongside my friends at our campus farm. The idea of growing my own food was so foreign to me that it piqued my interest, and it made me realize the connection that I'd lost to food from growing up in a city. Regaining a connection to how food goes from seed to plate was my biggest driving force in choosing to work alongside our amazing farmers. Why was it important for Brooklyn Grange to start City Growers, an education program for kids in New York? Diaz: When our founders started this farm, they got inundated with requests from schools across the city to see the farm. Wanting to share the farm with as many of them as possible, they began hosting field trips and educational workshops. Pretty soon, they realized that bringing New York City students up to the farms was a full-time job. Sharing urban agriculture with young city dwellers is so important because many of them don't have a personal connection to their food. It's easy to lose sight of how much work goes into growing food, and how far some food has to travel to make it onto our plates. City Growers is doing their best to change that and show kids that great food can come from their very own city. What are some of the biggest challenges of running a farm in the middle of the city? Diaz: There is one big challenge: space! Unlike rural farms, we don't have acres and acres of open land. On our rooftops, we know exactly how many square feet of growing space we have, so we try our best to maximize food production with the area that we’re given. Have you seen an increased interest in using locally-grown fruits and vegetables from restaurants? Diaz: Yes. More and more restaurants are realizing how important it is to locally source their ingredients. Food that comes from far away is usually picked when it is still unripe, which means that it lacks a lot of flavor and valuable nutrients. It also has to travel a long distance, which means the trucks and ships carrying that food tend to use a lot of gas and energy. Having food that tastes good and is better for the environment means better business for restaurants. We hope the trend will only get bigger and bigger.